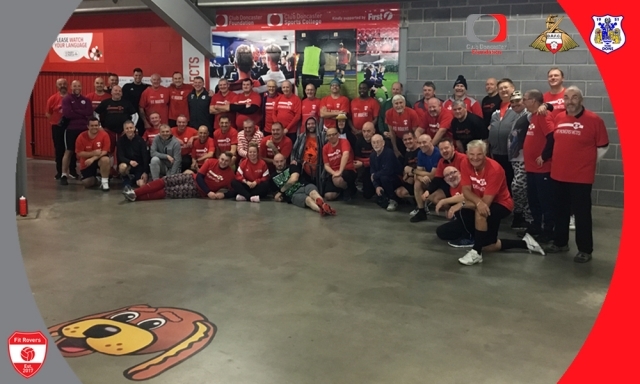 Doncaster Rovers chief executive Gavin Baldwin and Club Doncaster Foundation executive director Jim Lord joined the Fit Rovers course 10 participants as they both took part to show their support of the programme. They took part in the Fit Rovers session last Thursday night, while taking the time to interact with the participants and encourage them to keep building on their own success stories. Health and wellbeing officer Nick Gillott said: “over the course of the week we had a total of 139 attendances across the Fit Rovers project, being made up of 83 different people. “It was brilliant to see. Once again the support the football club offers the project is fantastic, with Gavin and Jim taking time out of their busy schedules to come down and take part in the session. It was great for the support of the project. The overall participation from Fit Rovers continues to surpass expectations, with football and circuit training both attracting more than 40 people on Thursday night. With course 10 soon reaching its penultimate stage, Fit Rovers ambassador and current Rovers player Matty Blair will be making an appearance as the participants get their results.